At N1 Analytics we use Kubernetes for running experiments, continuous integration testing and deployment. In this post I document setting up a Kubernetes cluster to automatically provision TLS certificates from Let's Encrypt using Jetstack's Certificate Manager, the helm package manager and the nginx-ingress controller. I wrote this after migrating our cluster from traefik to use cert manager and nginx-ingress. The end state will be one where we can create Kubernetes ingress with a TLS certificate with only a set of annotations in the respective helm template. I'm going to assume some background knowlege for this post, if you haven't heard of Let's Encrypt and Kubernetes - you may want to read up on those first! To follow along you will need access to a kubernetes cluster and the kubectl tool. There are a lot of moving pieces in the Kubernetes landscape, one of the most common methods of provisioning TLS certificates was kube-lego - also by Jetstack. However they have marked kube-lego as entering maintenance only and suggest to instead use their replacement project cert-manager. cert-manager takes a more kubernetes native approach to certificate provisioning and management. 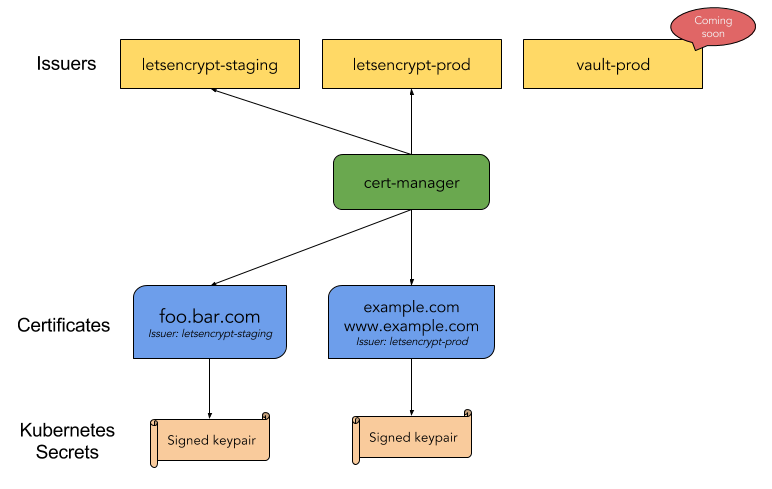 By using Kubernete's support for custom resource types they introduce resources for certificate issuers and for certificates respectively. Helm is the defacto package manager for kubernetes. With helm you can install packages of pre-configured Kubernetes resources, and share your applications as a chart. In the rest of this post I'm going to assume you have helm set up. With helm, software gets packaged up as charts which essentially provides templated deployments. Assuming you already have kubectl setup to access a kubernetes cluster, you can easily follow the helm installation docs for your platform. Now that you have the helm tool we can use it to install software from the stable charts repository or to package our own containerised software for installation into any Kubernetes cluster. This step is optional if you already have another ingress controller - e.g. the ingress controller provided on Google Cloud Platform. In my case I was using the Traefik ingress controller which has inbuilt Let's Encrypt support and decided to replace it with nginx-ingress and cert-manager. Another option is to configure the ingress controllers to only service particular namespaces. Not on AWS? Different clusters may have different approaches to route traffic to the ingress controller, look at adjusting the controller.service.type in the charts values. You should see the CNAME pointer you created in the answer section. Actually check your DNS before proceeding, you'll just not have fun if you have DNS configuration problems. If you are running at home or on a bare metal cluster this is almost certainly the first major hurdle. The component responsible for provisioning TLS certificates is cert-manager. Follow the deployment guide. cert-manager needs certificate Issuers in order to provision TLS Certificates. Like most of kubernetes, cert-manager takes a declarative approach; a Certificate contains the information required to make a certificate signing request for a given Issuer (Certificate Authority). cert-manager will negotiate with the Issuer (e.g. Let's Encrypt) to provision a certificate and will create a kubernetes secret with the TLS type that contains the keypair. This keypair can be referenced in an Ingress for nginx-ingress to use when creating the TLS terminating proxy route. Don't worry if this all sounds wildly complicated, this post will be going through most of it manually to unpack what happens. Because it is easy to have an incorrect configuration it is strongly recommended to first use the Let's Encrypt staging api. This has a much more forgiving rate limit than the production api. To test our staging Issuer we will create a Certificate resource which describes a certificate we would like provisioned. In this example we will create a certificate for the domain dummy.n1analytics.com. For illustrative purposes we will also make sure the certificate is valid for www.dummy.n1analytics.com with an alternative subject name. The commonName and dnsNames sections give you control of the Subject Alternative Names and common name sections of the provisioned TLS certificate. The acme section configures how cert-manager will prove to Let's Encrypt that we own the domain. In this case we have chosen to use the HTTP-01 challenge type. Because we are using nginx-ingress we set the http01.ingressClass to nginx so that when cert-manager creates an ingress for the Let's Encrypt http challenge it will include the required nginx annotation. There is much more information in the guide - well worth reading through especially if your setup is a bit different. In this case everything went well. Behind the scenes cert-manager created pods and ingresses to address the HTTP-01 challenge from Let's Encrypt and succefully issued a certificate! Note this ingress is referencing the TLS secrets that cert-manager created when provisioning our Certificate. This is a standard kubernetes ingress with TLS - nothing specific for nginx-ingress or cert-manager. Note you can also add extra annotations to the ingress to include things like basic authentication - which would be a very good idea if you were actually going to expose your kubernetes dashboard to the internet! After a short delay you should be able to visit https://dummy.n1analytics.com/ and see that the Let's Encrypt staging certificate was used. In short, to have an ingress use an existing TLS secret you have to add a tls section to the ingress resource. Create that Issuer and - as you can guess - any Certificate resources that have an issuerRef of letsencrypt will now use the production Let's Encrypt service instead. This project is experimental, and thus should not be relied upon in a production environment. This tool may change in backwards incompatible ways. All we need to do is add an certmanager.k8s.io/issuer annotation to an ingress. The issuer must exist in the same namespace as the ingress. Note the secretName defined here will be used by the ingress shim to create the kubernetes secret containing the TLS keypair. Issuers don't have to be namespaced. Create a ClusterIssuer following the user guide. To use with the ingress shim simply switch your ingress annotation to certmanager.k8s.io/cluster-issuer. Fair warning I had some trouble with the interaction between the ingress shim and the cluster issuer when you have other annotations on your ingress - cert-manager#286. For now the recommended approach is to create certificates directly - these can refer to the cluster issuer. So you want to add support for cert-manager in your own software? When the ingress shim is fully working this is as easy as allowing your chart's users to provide ingress annotations. It is worth noting that some of this information is duplicated in the ingress section. You may wish to add a section for multiple hosts as Let's Encrypt and the ingress controller would support that.